Before I was born my father enlisted in the Canadian Army. While he was over seas during WWII my mother delivered me. After a week my father was finally found in France and told of his new little baby daughter. He went into a department store there, one of the few that were still in operation, and he bought a doll for his little baby daughter. He carried this small 13-inch composition and cloth-bodied doll in his knapsack all through the war until he was severely wounded. After coming to a London hospital he was relieved to see that the doll for me had been kept safe, and was still in his knapsack. He was able to return home to Canada on leave three months later, with the doll for his little girl. I have her still, kept safe in a place of honor, for my mother had put her up in a safe place until I was older. 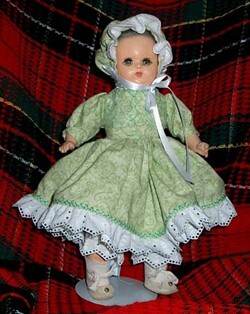 I have been collecting dolls for years now and have some very beautiful expensive dolls but my very favorite - most priceless - is the little 13-inch doll with go-to-sleep eyes, a gift from my beloved father, so many years ago. It was a pleasure to share my doll story with you and your readers. When I read it in print, it was like sharing my dad with others even though he's not here any longer, for he passed away 8 years ago. I liked the thought that others would read my doll story and know in some measure just what sort of a wonderful father he was, for he surely loved me, and I him. I showed the story to my 83-year-old mother, as she was reading it a smile crept across her face as she remembered the particulars surrounding that doll. My dad had been severely wounded as I said, but his "dog tags" went missing so they didn't know who he was for he lay unconscious in that London England hospital for 3 weeks. Word came to my mother that he was missing in action. My Mother, having just had me, believed that he was gone forever. When he finally regained his memory he remembered the doll and asked for his knapsack, low, there she was safe and sound. My mother rejoiced greatly to know her husband was safe, and I still had a father, who I didn't see until I was 3 months old... He has been and ever will be dear to my heart! was "gone" 24 hours later. old doll is here still. You'd be no longer here. although you made no sound. Did you feel my presence there? Could you sense my longing prayer? that the Lord might spare your life. Our family bond close to your heart. His Blessed Face you now behold. Sits here throughout my years. Loving and caring right to the end. your time with us went too quickly. He knows what’s best, for me, for you. and never shall we part. In Loving Memory of Ruby, by her Daughter Joan, August 10 2007.